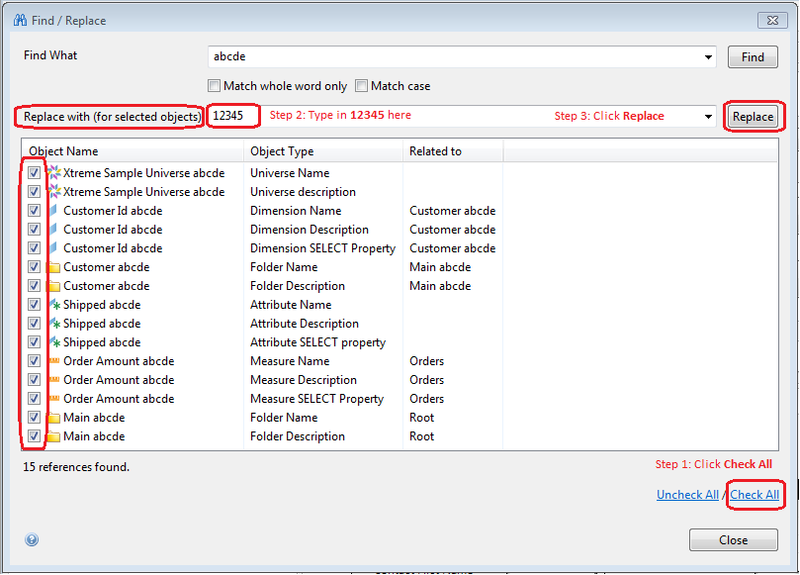 We’ve seen many Developers requesting for a feature that would help to rename Objects in bulk. One such idea was created in Idea Place, hoping that feature becomes a reality, and hopefully save hours of work. This list may have a few more things, frankly speaking, I didn’t bother to research further. and so on, check out the images. 1. Open the Business Layer, in the File menu bar on top left, click Edit -> and click Find/Replace. 2. 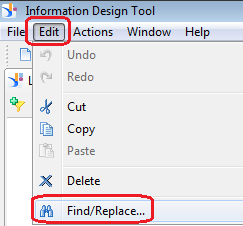 In the Find/Replace window that opens up (which is similar to find/replace in Microsoft Word Document), in Find What area, type in “abcde” and click Find. Let’s see what we get, after the update I made to the Universe for this demo. 3. 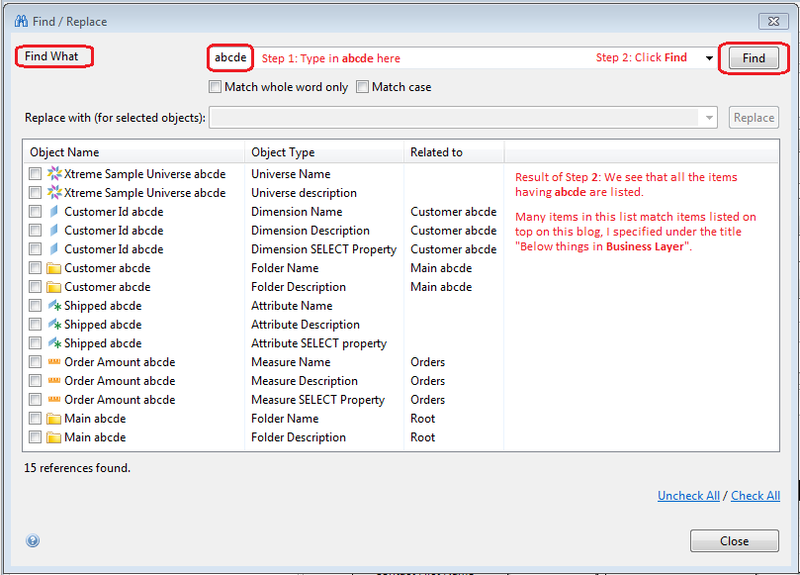 Check the boxes of all the items you want to rename or, if you want to rename all the items in the list, click on Check All on the bottom right, and write the text whatever you want to rename with, in the Replace with (for selected objects) space and click Replace. For demo, let’s replace abcde in all the items with 12345. 4. 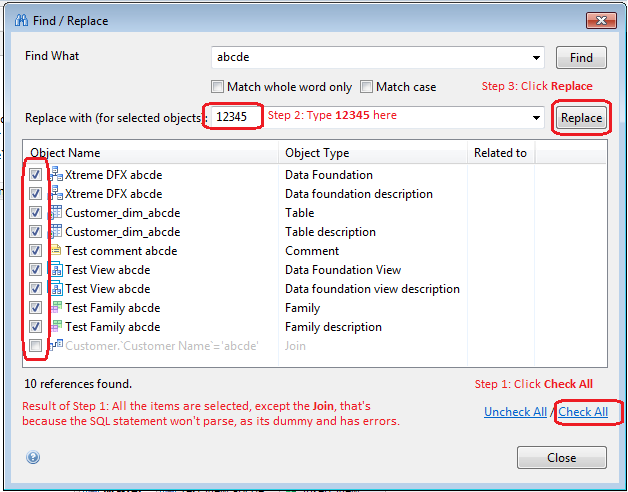 We see a dialog box that says Find/Replace has been done on the 15 items checked. Close this window by clicking OK.
5. Testing the changes – Check the Business Layer Name, Description and other items as shown in the below images. 1. Open the Data Foundation Layer, in the File menu bar on top left, click Edit -> and click Find/Replace. 2. 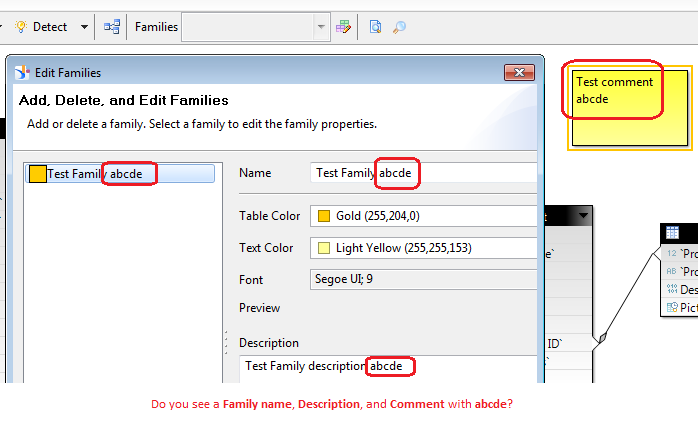 In Find What, type in abcde and click Find, this is what we see. 3. 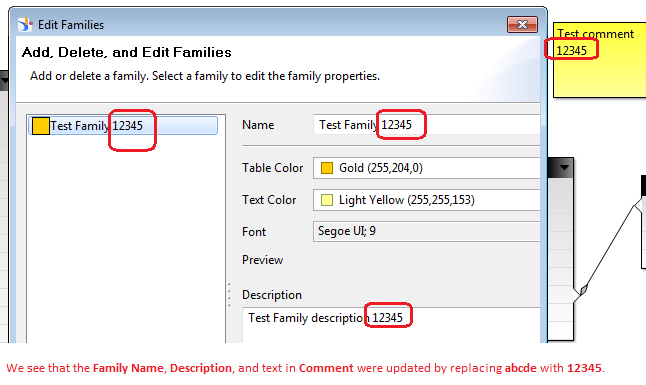 Click Check All on bottom right, type in 12345 in Replace with (for selected objects) space and click Replace. 4. A dialogue box appears with the confirmation, click OK to close it. Voila, we got it, it was a simple test though..
Hope that helps, thanks for reading this blog – comments and/or feedback is welcome. There is one thing missing, which can be called a bug, and which I came to know about from this idea. 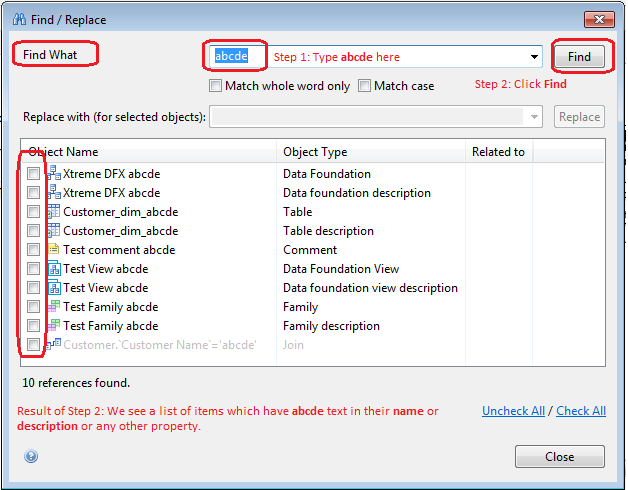 Using the Find/Replace option, if and when we change table name from the SELECT Property of Dimension/Measure/Attribute/Filter object (which are item numbers 6, 10, 13, and 16 on the list from Business Layer), the reference table doesn’t change, and the validation fails with errors. Check out that idea for more details with screenshots, please vote up on it, hopefully we get enough votes and that potential bug is addressed. Exactly the kind of technical deep-dive w/ screenshots that make blogs on SCN so useful when done right. Thanks, Mahboob. I’ll be sure to share these tips with our team and refer them to your post! Glad you liked it Atul !!! Glad you liked it, hopefully you and/or others can use it!